« Attack of the imaginary chewdaddies. Along with white pants and Andalusian gazpacho, a refreshing Pimm’s cup forms the triumvirate of summer in our house. 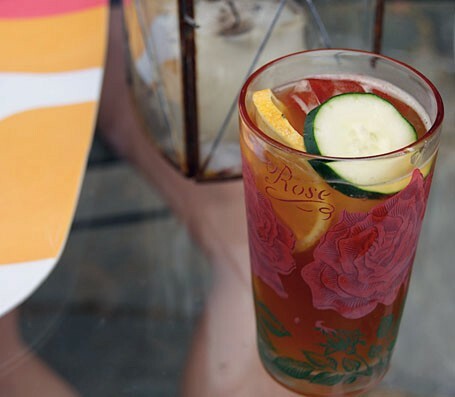 As it is already July, if you haven’t yet sat on a porch with a Pimm’s in hand, summer hasn’t officially started. Luckily, I was able to spend most of the last weekend doing exactly that as the nightmare of June faded into an itchy memory. Step 1: Play a game of croquet, or involve yourself somehow in a polo match, a regatta or Wimbledon (if possible). Step 2: Retire to the lawn, or the porch, or the gazebo. Step 3: Fill your glasses or a pitcher with ice. Step 4: Add a 50/50 mixture of Pimm’s and a carbonated lemonade. I recommend Lorina sparkling lemonade, but that’s just me. Step 5: Garnish with slices of cucumber, lemon, and orange. Mint would be good, too, although I often forget this. Some people go so far as to add strawberries, but I find them to be unnecessary. Step 6: Stir the drink to mix the elements and the garnish. Serve with salty snacks. Step 7: It’s Pimm’s o’clock! Suddenly that slightly dank back alley that you refer to as your “outdoor space” is the Garden at the Goring Hotel. Trust me. It works! For more on Pimm’s Cups, check out Historical Foods. This entry was posted on July 7, 2011, 9:31 pm and is filed under inspiration, Recipe. You can follow any responses to this entry through RSS 2.0. You can leave a response, or trackback from your own site. it was lovely meeting you today! and you have a beautiful blog :D. think i found you on twitter and facebook (but had to search for you since the link wasn’t there). see you in the blog world. happy gluten free baking! Pimms also benefit from salty snacks, n’est ce que pas? How could I have forgotten that! In fact, I think I will avail myself of some salty snacks right now!